TIG (tungsten inert gas) welding is a common arc welding process that is used on stainless steel and non-ferrous metals like copper, aluminum and magnesium. This method is typically applied to thin metal sections. TIG welding allows the welder to have better control over the weld, especially when compared to welding methods like gas metal arc welding (GMAW). It creates higher quality welds that are stronger. In addition, this welding type is the least likely to cause skin burns. Tulsa Welding School’s Professional Welder training program ensures that students are thoroughly trained in this method, so they are able to qualify for an entry-level position in a promising manufacturing career. Payscale.com states that the median wage for a TIG welder is $17.00 per hour, or $44,408 per year, often with plenty of overtime opportunities. TIG welding is especially common in industrial manufacturing sectors, including the automotive industry. As a matter of fact, as a TIG welder, you may actually even have the chance to land a thrilling job in NASCAR one day. The U.S. Department of Energy reports that the average car has 4,000 welds, which emphasizes the importance of a welder’s work for a vehicle’s safety and performance. Every NASCAR racecar needs hundreds of welds that have to be strong yet light enough to meet the demands of the track. The body must be sufficiently robust for the driver’s protection without being too heavy to overly slow down the vehicle. 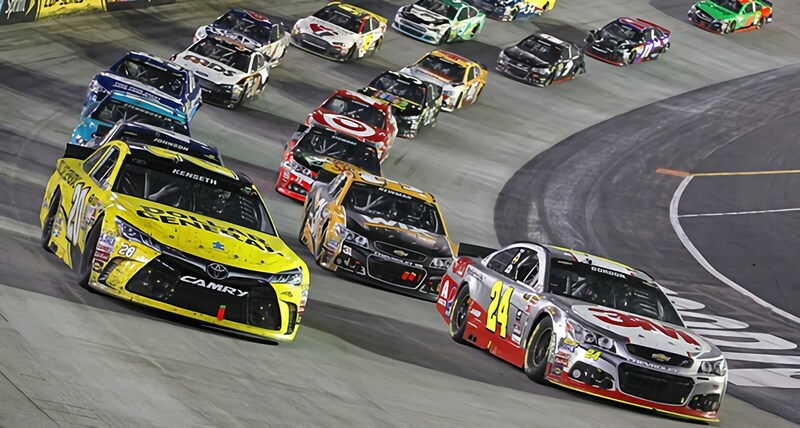 This is why TIG welding is the preferred method for manufacturing NASCAR racecars—it permits welders to work on thin metal with the greatest precision. Fabricating a racecar takes a lot of tools: snips, grinders, pneumatic tools, deburring knives, adhesives, abrasives, fasteners, cutting tools, CNC equipment, lasers, drill bits, shears, saws, drills, nuts, bolts, and, of course, welding equipment. Almost all NASCAR racecars are TIG-welded by hand. Welded racecar parts include the chassis, spoilers, seat brackets and the rear-end housings connected to the upper and lower control arms. The majority of welds performed for a NASCAR vehicle involve intersecting tubes that form the frame and the roll cage. Both parts are made from mild steel, which lets the car absorb the forces of a crash in a bend-before-break mode. It takes about 950 man-hours for a team of welders to fabricate one single NASCAR vehicle in the shop. Since there are so many different welds involved in building one car, almost everybody at the racing fabrication shop will end up welding one part or another. While most welders who fabricate racecars for NASCAR work the shop, some may actually be part of the pit crew—an exciting, yet also challenging opportunity. Daniel Smith began his time working for NASCAR at Stewart-Haas Racing. The 29-year-old explained that it has always been his dream to become a welder. Born and raised in the epicenter of motorsports, Concord, NC, Smith attended NASCAR Technical Institute and 5 Off 5 On Pit Crew U in 2004. He subsequently started to work full-time for Haas CNC Racing, a NASCAR racecar fabricator. Being extraordinarily passionate about his vocation, Smith would stay after work just to see what the other welders were doing and to learn some tricks of the trade. He was quickly promoted from the teardown department to working in the fabrication shop due to his hard work and dedication. There are countless opportunities for TIG welders in a variety of manufacturing industries. Although you may never get to participate in a NASCAR race as a driver, a career as a TIG welder may still enable you to become an indispensable member of a NASCAR pit crew. If you wish to learn more about TIG welding, consider enrolling in a welding training program and contact us today.